A few years back our family took our first cruise. None of us had ever been on a cruise before so we weren’t quite sure what to expect, but is was an adventure we were ready to try. And now, we are hooked. We had such a great experience. When it comes to planning vacations, we keep coming back to the cruise vacation! Sure, we have fit in a few other vacations in between our cruises, but ultimately, the cruise makes everyone in our family happy. Because there are so many activities, both on and off the boat, this seems to fill each persons desire of what they want to do. Of course, throw in endless amounts of food, served around the clock, and my three teenagers are over-the-top happy! Also, as much as we enjoy hanging out together, the cruise gives everyone just a bit of freedom as well– someone can run to the gym for a quick workout, a few can go play a trivia game, we all enjoy getting off the boat for an excursion or some exploring on an island–the options are endless. 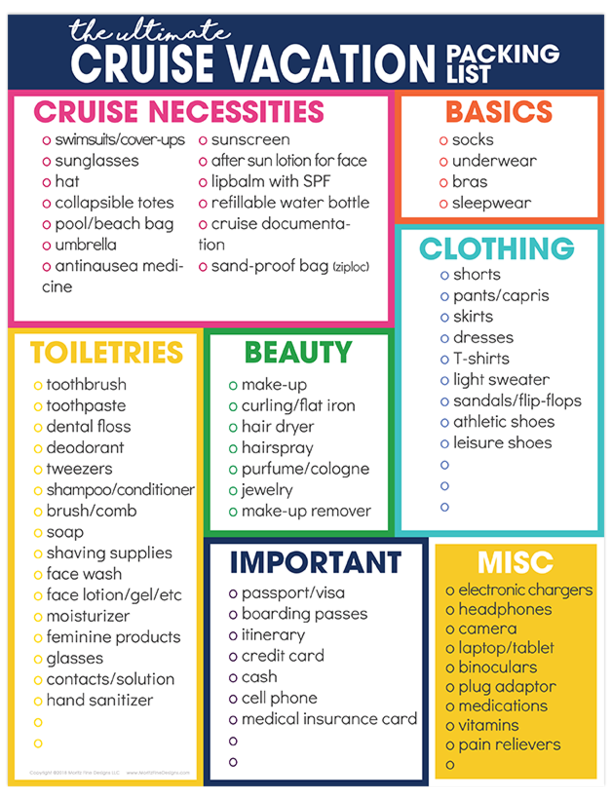 With so many different activities, it’s hard to know what to pack! Over our numerous trips we have refined exactly what to bring and finally feel like we have a really good checklist and are prepared every time we walk on the boat. 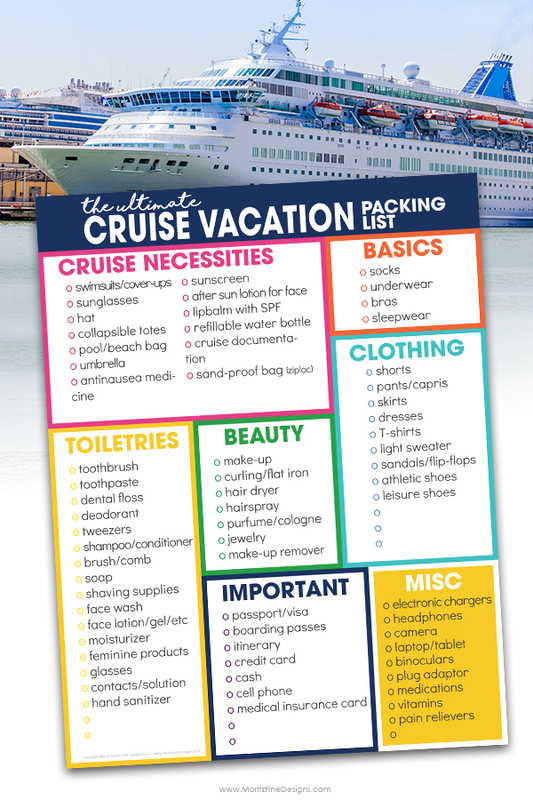 Be sure to download and print the Cruise Packing List below. One thing to keep in mind is that the list was created with a warm-weather destination in mind. So, if you are hitting up an Alaskan cruise, you are definitely will need to modify the list and grab some warmer clothing items and skip the bathing suit! Headed on vacation that’s not a cruise? Be sure to grab our Beach Vacation Packing List or our Winter Vacation Packing List!